We were in Winnipeg, Canada late last year, for The Kickstand Sessions. One evening before the Sessions began, we walked from our hotel to a restaurant (saw two other pedestrians!) along Pembina Highway. Our host with the most, Anders Swanson, asked if we wanted to see a cycle track solution by a bus stop. Sorry, but when I'm in North American cities and someone wants to show me bicycle infrastructure, I've learned not to get too excited. Seen one crappy painted lane too narrow for a bicycle user to overtake another and mostly used for unenforced car parking and you've seen them all. If it's a painted on on the LEFT side of parked cars instead of along the curb, I'll politely decline and blame jetlag - that's not bicycle infrastructure, that's the work of people who shouldn't be working on bicycle infrastructure. If it's sharrows... I'd rather poke myself in the eye with a burned stick. I was pleasantly surprised when we happened upon the cycle track in question. A decent width - not Best Practice but better than other stuff I've seen around the world. Running along the curb. 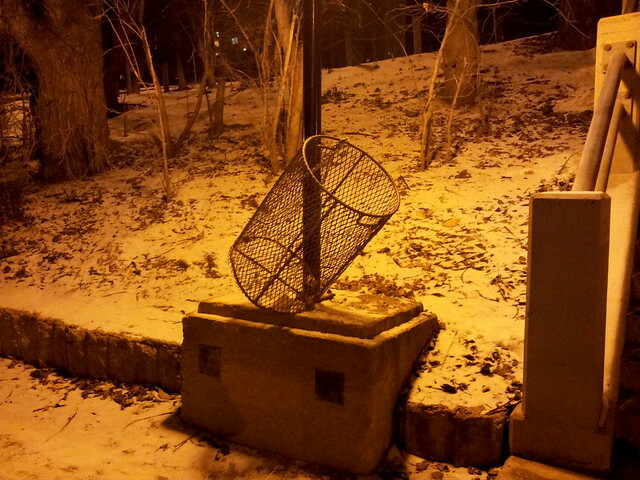 And there was the bus stop. Who knew? Right there in Winnipeg, Manitoba was a cycle track that skirted around a bus stop island. I felt like I was at home in Copenhagen. What is this place? This Winnipeg? What on earth possessed the engineer responsible to be inspired by established best practice instead of the last-century, car-centric "guidelines" for bicycle "infrastructure" written by people who couldn't bicycle plan their way out of a wet paper bag? Is the Louis Riel spirit alive and well in the Manitoban capital? 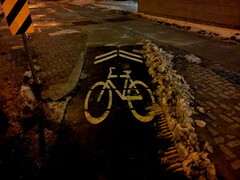 When you see a lot of crap in cities around the world, something like this warms your heart on a frigid prairie night. Hey, let's be realistic. Winnipeg is not Montreal or Minneapolis - the two premier bicycle cities in North America. They're starting out on their journey. But while the rest of the continent - not to mention cities in the same region - are still lacing up their booties and ordering feasibility studies about the possibilities of perhaps considering taking their first baby steps by contemplating a single cycle track to nowhere, Winnipeg is toddling onwards. 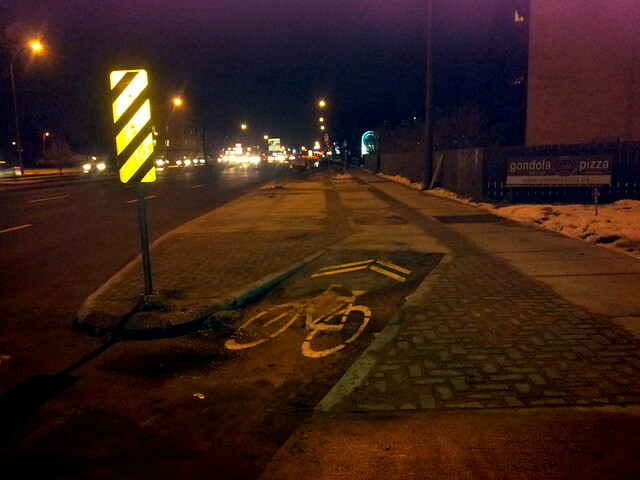 It's a cycle track with a sensible bus stop solution on a road south of the downtown. Sure. It's not part of a complete network. Nowhere near. Let me tell you though, that this little cycle track bus stop strip is a beacon of light in a world of nonsense. 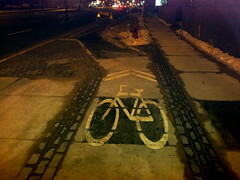 The cycle track is new. And it's Winnipeg and they have winter. They call themselves Winterpeg. 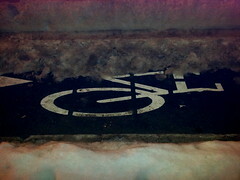 Winter cycling is "no longer weird in the city" but there is still a learning curve ahead. 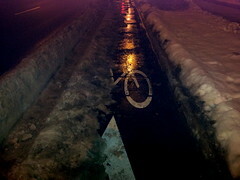 The cycle track wasn't totally snowploughed, but my god they had tried. Again, better than most cities. If I can get excited about all of this, it's probably going to get better. Copenhagenize Design Co. recently won a bid - together with our partners - for Winnipeg's Pedestrian & Cycling Strategies. Working with a city that is ahead of game will be a pleasure. On the way from one bar to the next one night, along the river, we ceremoniously tilted a garbage bin into a Copenhagenize cyclist-friendly garbage bin. They also have beer in Winnipeg. The Kickstand Sessions are a master class for planners, engineers, health, transit, architects, etc. in bicycle planning for North American cities based on Dutch and Danish best practice. At the end of the sessions - after two days of bicycle planning and infrastructure work - we wrap up with communications. How would the participants communicate their vision for the city? They're not in marketing, but they're professionals/citizens/consumers with a vision. Developing a common language is important, especially when you're in a room with people from so many different professions. It's a great way to round off the master classes. 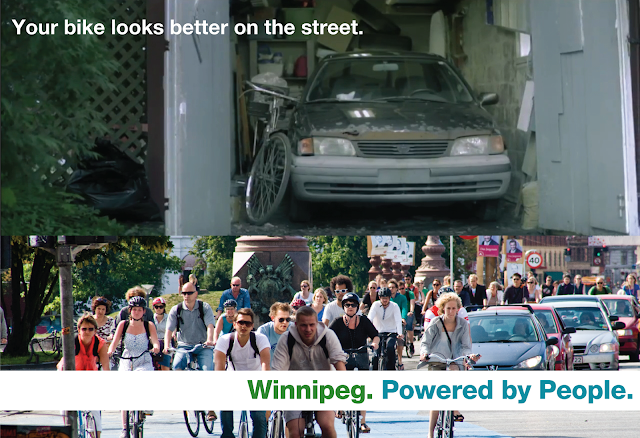 Your bike looks better on the street. Winnipeg. Powered by People. Indeed. Powered by, among others, these people. The Kickstand Sessions participants. Not everyone was from Winnipeg - some participants came in from Portage la Prairie and even Thompson - but people power they all surely possess.